Daytime activities include model rocket building and launching; programs inside Dickinson State University’s Discovery Dome, solar viewing, solar system hikes, telescope building, and family activities. NASA lunar samples (moon rocks) will be on display. 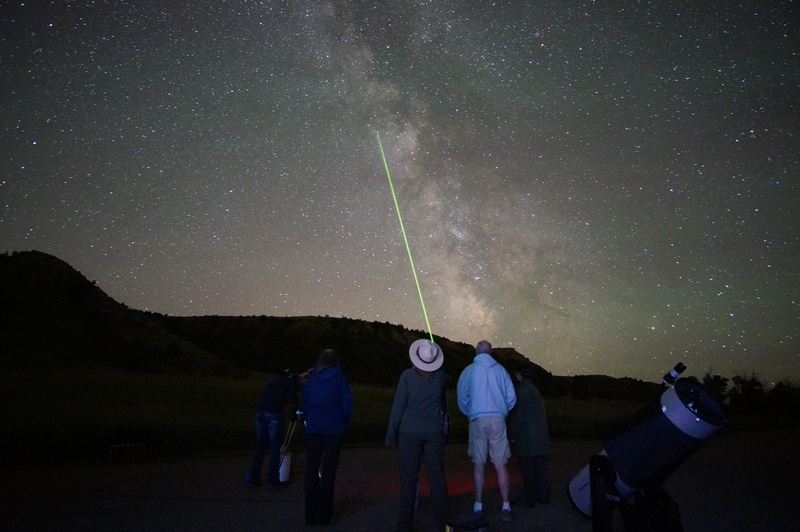 Evening star gazing with a field of telescopes manned by park rangers and astronomers will take place at historic Peaceful Valley Ranch in the park. The full schedule of events is available for download at www.nps.gov/thro. What: Dakota Nights Astronomy Festival. Where: Sites in Theodore Roosevelt National Park: South Unit Visitor Center, Cottonwood Campground, Peaceful Valley Ranch. Sites in Historic Medora: Chimney Park, North Dakota Cowboy Hall of Fame. Images: Lunar samples, children launching model rockets, park rangers leading astronomy related activities, public star gazing, presentations by special guests. Interviews: Dr. Tyler Nordgren, Dr. Joe Shaw, Dr. Paul Barnhart, park staff, various astronomers. Pre-event interview opportunities may be available. This Media Advisory was originally written by Eileen Andes of the Theodore Roosevelt National Park Service.